Be noted that there are fishing nets before the entrance of the port. Moving through outer breakwaters to the east, there is a port with quay and inner breakwaters. Turn to the south along the quay, you will see pontoons for fishing boats on your east and west sides both. I moored at the innermost south quay alongside. Some pontoons were not occupied though, any fishing boat might return to those pontoons in the middle of night. Then, mooring at the innermost south quay looks good for visitors. It is a scenic clean town with a long history. Toilet at near Aji Tourism Exchange Hall, which is at a road behind the center of the port, is clean. But, it is closed at night. Coin laundry is 20 minutes bus ride away. It is at a bus stop in front of a tennis court in Mure town. Provisions: You can buy most of provisions at a Nokyo (Agricultural Cooperative Association) supermarket behind the center of the port. Fuel is at a gas station next to Gyokyo (Fisheries Cooperative Association). Water is also available at the gas station. 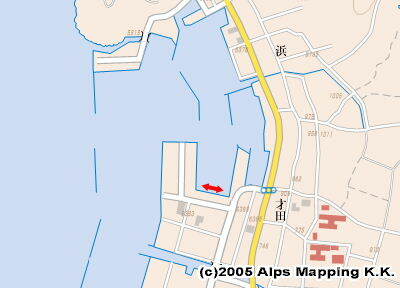 There is a municipal public bathhouse behind the center of the port. You may also take a bath at an inn 7 to 8 minutes bicycle ride away. When I was at Aji Port, it happened to be closed for construction work though, there is a famous big onsen (= spa) at a hill 10 minutes bus ride away. Japanese words of “shima” or “jima” is “island” in English. Ya-shima was an island though, now it is a part of Shikoku main island. Two islands have been connected with landfills.